Here is a very brief example of an Industry Analysis for the Cases using Wal-Mart, specifically Wal-Mart’s competition in the consumer retail industry and not in the industries where it competes. Remember, that you are concerned with where Wal-Mart is positioned in the industry relative to the respective industry forces. o	Grocers could potentially enter into the retail side. o	Entry barriers are relatively high, as Wal-Mart has an outstanding distribution systems, locations, brand name, and financial capital to fend off competitors. o	Wal-mart often has an absolute cost advantage over other competitors. o	Currently, there are three main incumbent companies that exist in the same market as Wal-Mart: Sears, K Mart, and Target. Target is the strongest of the three in relation to retail. o	Target has experienced tremendous growth in their domestic markets and have defined their niche quite effectively. o	Sears and K-Mart seem to be drifting and have not challenged K-Mart in sometime. o	Mature industry life cycle. o	The individual buyer has little to no pressure on Wal-Mart. o	Consumer advocate groups have complained about Wal-Mart’s pricing techniques. o	Consumer could shop at a competitor who offers comparable products at comparable prices, but the convenience is lost. o	Since Wal-Mart holds so much of the market share, they offer a lot of business to manufacturers and wholesalers. This gives Wal-Mart a lot of power because by Wal-Mart threatening to switch to a different supplier would create a scare tactic to the suppliers. o	Wal-Mart could vertically integrate. o	Wal-Mart does deal with some large suppliers like Proctor & Gamble, Coca-Cola who have more bargaining power than small suppliers. o	When it comes to this market, there are not many substitutes that offer convenience and low pricing. o	The customer has the choice of going to many specialty stores to get their desired products but are not going to find Wal-Mart’s low pricing. o	Online shopping proves another alternative because it is so different and the customer can gain price advantages because the company does not necessarily have to have a brick and mortar store, passing the savings onto the consumer. o	One complementor that exists for Wal-Mart is Sam’s Wholesale Clubs. Although the same company owns this, it complements Wal-Mart by offering the same products in wholesale form, making the company more profitable. 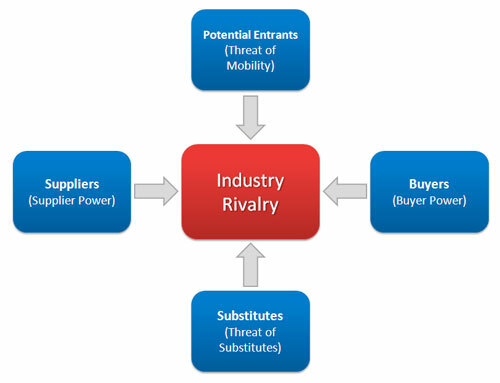 o	Suppliers of goods need to have innovative products to attract customers. Simple & easy to understand ………… Thanks u !!!! great stuff made so simple. cheers! could you say your reference for this subject? The model can be effective even though it has it’s short comings. My interest is on the possibility of applying Porters model in a public sector, where government provide services for free. hi! you have made our studying and understanding simple, thank you for that, but what is your reference? can you give me an example in Porter’s five forces model on public sector? it really written in a simple and understandable format even a layman may have got it .Thanks for such a nice stuff. it really written in a simple and understandable format, even a layman may have got it .Thanks for such a nice stuff.